'Mega-Robbery' In Paraguay: Dozens Reportedly Took Part In Violent Heist : The Two-Way A gang of some 50 bandits assaulted a private security company and reportedly made off with millions of dollars in what's being called a crime of the century on Paraguay's border with Brazil. 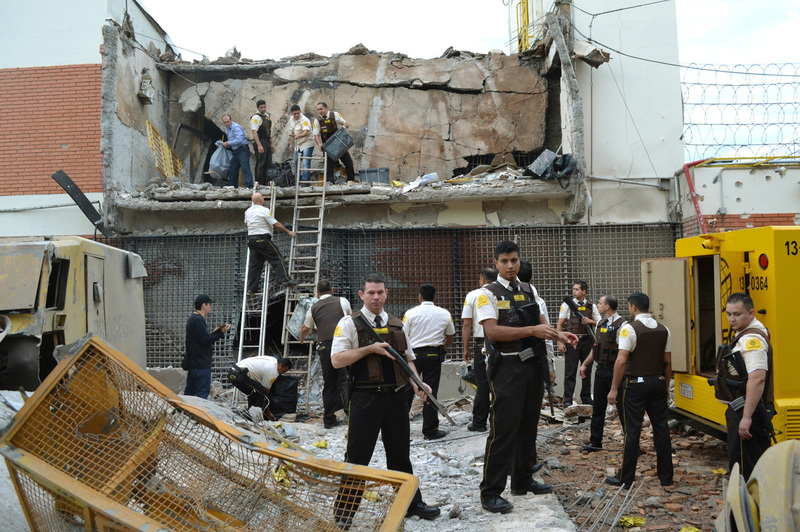 Guards and police inspect a vault that the assailants blew up early Monday morning in Ciudad del Este, Paraguay. Explosions, a running gun battle, hostage-taking and an attack on a police station took place along Paraguay's border with Brazil on Monday, as a gang of bandits assaulted a private security company and reportedly made off with millions of dollars in what's being called the biggest heist in Paraguayan history. Estimates of the amount of money taken have ranged from $8 million to $40 million, but none of those figures have been confirmed by authorities. At least one police officer and three suspects have been killed, and at least nine arrests have been made, according to local officials and Brazilian media. All of those arrested are Brazilian. Details about the raid are still emerging, but police believe some 50 heavily armed thieves took part in an early morning assault on the Prosegur security group's local headquarters in Ciudad del Este, a city that's across the Parana River from Brazil. They reportedly used explosives to blow the front off the security firm's building and take the cash, before firing on police and setting more than a dozen cars on fire to cover their escape. "This type of crime is not for amateurs," said local Federal Police Delegate Fabiano Bordignón, according to the newspaper Folha De Sao Paulo. Headlines are calling it the crime of the century, or simply, a "mega-robbery." The criminals then used Prosegur's armored trucks to transport their haul — at least some of which then went across the river to the Brazilian town of Foz de Yguazú, officials say. That's where a mansion was found later Monday that federal police say the criminals may have used as a staging area. Search and forensics teams are working on evidence from that house, according to Brazil's G1 news network. The bandits also stole a police car, reports Brazil's O Globo, which adds that early Tuesday morning, the gang members released "11 people, mostly rural workers, who had been taken hostage." 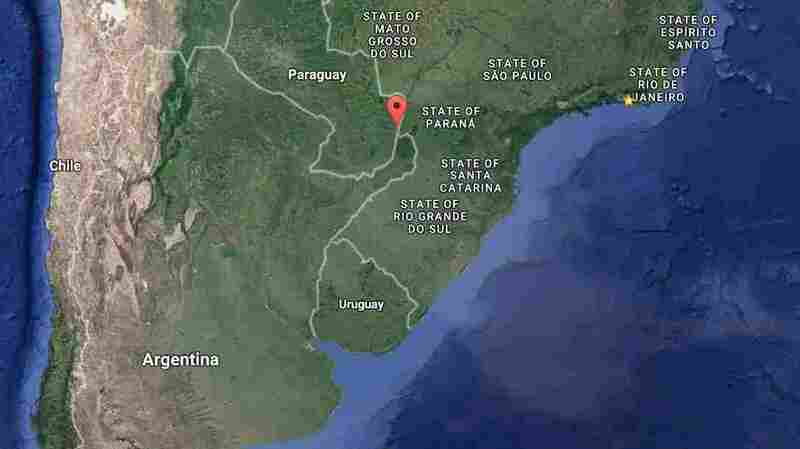 The city of Ciudad del Este, in eastern Paraguay, was hit by a raid Monday. Officials believe the bandits then scattered across the border with Brazil. Hundreds of military and civilian police have been deployed to find the thieves, who are believed to have scattered in smaller groups after the robbery. Bags of cash were recovered in Foz de Yguazú, Paraguay's Minister of the Interior Lorenzo Lezcano Sánchez said Tuesday, along with five machine guns, a .50-caliber rifle, seven cars and vans, two boats, and 7 kilograms of explosives, according to an official statement. Ammunition and bulletproof vests were also seized. Paraguay's Interior Ministry and officials in Brazil have said they suspect a Brazilian gang called the PCC (Primeiro Comando da Capital, or First Command of the Capital) could be behind the operation. If that connection holds true, the mastermind could be a 42-year-old man named Luciano Castro de Oliveira — more widely known as Zequinha — who remains at large, as the newspaper Clarin reports.